Bob Vila Radio is a newly launched daily radio spot carried on more than 60 stations around the country (and growing). You can get your daily dose here, by listening—or reading—to Bob’s 60-second home improvement radio tip of the day. Today, it’s all about the Custom Closet. A custom, walk-in closet installation is a great Mother’s Day present, but there are some easy fixes you can do on a smaller budget. Start by measuring the amount of rod, shelf and drawer space you need. Double up with top and bottom rods to hang shorter clothes in half the wall space. Add shelving above the rod for boxes and baskets. Fit floor-to-ceiling or hanging shelving units wherever you have a couple of feet of space. You want to keep things off the floor for easier cleaning. Shoes are the biggest closet challenge. keep the ones you don’t wear often stacked in boxes labeled with their photos. store only your favorites on slanted racks for easy access. You might want to lose those skinny wire hangers and invest in wood or padded hangers, and install a valet hook for hanging what you just ironed. 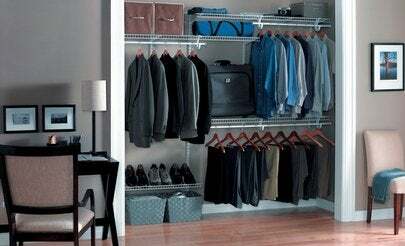 After all, your closet’s main job is to help you keep your clothes in shape and ready to wear.